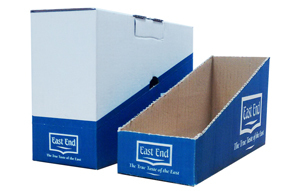 Transport your products from the warehouse and directly onto retail shelves in one single packaging box with our shelf ready packaging solutions. We here at CBS manufacture shelf ready packaging that is efficient, provides maximum protection during transit and also increases brand awareness with our vibrant printed packaging options. Our team of experts will help you every step of the way to create your bespoke shelf and retail ready packaging that meets high street retailer requirements. 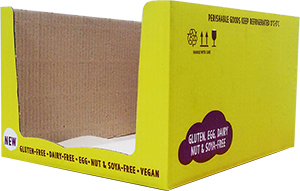 Our corrugated packaging is 100% recyclable. We here at CBS take pride in manufacturing shelf ready packaging that is strong and versatile while also respecting the environment. Get in touch with our friendly team to discuss your packaging requirements, we will be happy to help and guide you through the best options for your product.